We’d love your help. Let us know what’s wrong with this preview of Happy Never After by Jill Stark. Getting her happy-ever-after plunged Jill into the darkest period of her life, forcing her to ask if she’d been sold a li Jill Stark was living the dream. She had a coveted job as a senior journalist, she was dating a sports star, and her first book had just become a bestseller. After years of chasing the fairytale ending, she’d finally found it. And then it all fell apart. From the ashes of Jill’s epic breakdown comes this raw, funny, and uplifting exploration of our age of anxiety. Charting her own life-long battles with mental health, Jill asks why, in a western world with more opportunity, choice, and wealth than ever before, so many of us are depressed, anxious, and medicated. When we’ve never had more ways to connect, why do we feel so profoundly disconnected? Happy Never After is a soul-searching journey from despair to clarity and a forensic examination of our troubled times. 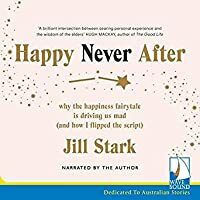 Road-testing neuroscience’s latest psychological frontiers in compassion, acceptance, gratitude, play, hope and solitude, Jill turns the happiness fairytale on its head, and swaps the ‘quick fix’ approach to mental health for the long road back to herself. To ask other readers questions about Happy Never After, please sign up. This was a bit disappointing to be honest - I loved High Sobriety and am generally a big fan of Stark. This is a brave and clear book about her struggles with anxiety and depression, but it felt like a slightly mix of shallow research and memoir - having just read Fiona Wright's superbly thoughtful book about her struggles this just felt a bit underwhelming in comparison. I like Jill Stark. She sounds like someone I could be friends with. She sounds like she could live in my apartment building. I've read some of her writting in The Age. I like memoirs. I love a redemption memoir more than anything - except one read by the author on audio book. So why was this book dissapointing? Rather than feeling like I was following Jill's journey, it felt like a collection of "things I've tried". Some chapters felt like newspaper columns, rather than parts of a narative struc I like Jill Stark. She sounds like someone I could be friends with. She sounds like she could live in my apartment building. I've read some of her writting in The Age. I like memoirs. I love a redemption memoir more than anything - except one read by the author on audio book. So why was this book dissapointing? Rather than feeling like I was following Jill's journey, it felt like a collection of "things I've tried". Some chapters felt like newspaper columns, rather than parts of a narative structure. Some were just annoying - yes, motorbikes are loud and horribe and scare my cat too, but what am I meant to do about it? I was either crying, laughing or learning. And often all three. I loved it. Just loved it. A moving, insightful analysis of our collective pain and how we can heal. Australia needs this book. Funny, wise, poignant and compelling, Happy Never After is a brilliant intersection between searing personal experience and the wisdom of the elders: nothing brings us closer to despair than the relentless pursuit of our own happiness. Faced with the crippling paralysis that comes with anxiety and depression, Jill Stark doesn A moving, insightful analysis of our collective pain and how we can heal. Australia needs this book. Faced with the crippling paralysis that comes with anxiety and depression, Jill Stark doesn’t completely crumple. Instead, she does what a good journalist does: looks it directly in the face in order to explain, investigate, and reveal. Anyone who reads this book who lives with anxiety will be a beneficiary of its courage and clarity. By looking back on her childhood, interviewing experts and amassing anecdotal data, Stark expertly links her lifelong struggle with anxiety with a collective social malaise that is exacerbated by our constant connectivity, underfunded mental healthcare systems and the pervasive ‘happiness myth’ … The book’s resounding takeaway that there are multiple ‘happy-in-betweens’ instead of one ‘happy-ever-after’ is an uplifting and liberating one. Extraordinary … Stark address[es] this vexed question of what effect our over-stimulated, almost constantly wired brains are having on our sense of well-being. This is a book we need. Highly, highly recommended. Puts a deft finger on many things that I guarantee have been quietly troubling you for a while. A book for our times. Jill picks up where Johann Hari left off with Lost Connections. A very personal story of anxiety and depression, that illuminates how it it takes a village to keep an individual emotionally and mentally well; that in fact, it is all about connection, and the impacts of what happens when we are disconnected in the modern world. This is my first review and I have been prompted by the transforming force of wisdom in this book for those amongst us who seek connection and the courage to live with our imperfections. Jill Stark is an Australian journalist living and working in Melbourne - in my 'hood in fact which was an enjoyable bonus to recognise local landmarks and places - this is her second memoir and deals with a crisis in her life when she ostensibly 'had it all', a fantastic job, the AFL footballer boyfriend and the This is my first review and I have been prompted by the transforming force of wisdom in this book for those amongst us who seek connection and the courage to live with our imperfections. Jill Stark is an Australian journalist living and working in Melbourne - in my 'hood in fact which was an enjoyable bonus to recognise local landmarks and places - this is her second memoir and deals with a crisis in her life when she ostensibly 'had it all', a fantastic job, the AFL footballer boyfriend and the dream come true of having her first book published. But all this abundance didn't lead to 'happy ever after' in fact she became very unwell and the book is about how that myth doesn't serve those of us that buy into it. and other forms of mental illness and addiction. What sets this book apart for me from others like it that I have read, is that it didn't invoke my tendency to put on my armchair shrink hat and form my own view on the life of the story teller. This is because, Stark leads an examined life and achieves what I think is an extraordinary feat of synthesising a massive amount of insights she has gained throughout her long journalistic career, her work with a caring therapist, conversations with dearly loved and loving friends (and cat! ), wide reading and research and finding what works for her (e.g. lying in a patch of sun on the rug with said cat). This is a powerful memoir that explores the author's experiences as she works towards healing and recovery following a breakdown and a lifetime of depression and anxiety. The author's journalistic background is apparent as she weaves her own narrative with research and interviews about how modern life sells an unrealistic picture of 'happiness' which is rarely achievable and instead creates disillusionment and disconnection. The author gives a frank and raw account of her breakdown and her illnes This is a powerful memoir that explores the author's experiences as she works towards healing and recovery following a breakdown and a lifetime of depression and anxiety. The author's journalistic background is apparent as she weaves her own narrative with research and interviews about how modern life sells an unrealistic picture of 'happiness' which is rarely achievable and instead creates disillusionment and disconnection. The author gives a frank and raw account of her breakdown and her illness, and how she began to rebuild herself with the support of therapy and close family and friends. There is a great deal in the book that felt very familiar to me. For me, Jill Stark’s book was the standout of the year – to the point where I’m actually re-reading it in audio book form, immensely enjoying the sound of her dulcet Scotstralian tones. From a societal perspective, Stark had it all. She’d reached what she thought was the pinnacle of her career, publishing a book (High Sobriety about her year off alcohol, also very good) which became a bestseller. Her job as Health Reporter at Melbourne newspaper The Age brought her satisfaction. She had bought an For me, Jill Stark’s book was the standout of the year – to the point where I’m actually re-reading it in audio book form, immensely enjoying the sound of her dulcet Scotstralian tones. From a societal perspective, Stark had it all. She’d reached what she thought was the pinnacle of her career, publishing a book (High Sobriety about her year off alcohol, also very good) which became a bestseller. Her job as Health Reporter at Melbourne newspaper The Age brought her satisfaction. She had bought an apartment, which she shared with a doting pet cat called Hamish and was even dating a lithe and well-sculpted young AFL player. She was only in her mid-thirties, but she’d “made it”. Stark has also suffered from crippling anxiety all her life and shortly after publishing her book, her world came crashing down around her ears, as her mental health spiralled out of control. Unable to work, she struggles to piece herself back together within the Australian mental health system, encountering many barriers along the way (such as a psychologist who ‘breaks up’ with her, what a terrible thing to do to a patient). In this fantastic book, she examines our obsession with ‘happiness’ – how this often fleeting emotion is marketed to us as the thing we must all aspire to and what it does to our mental state. She seamlessly interweaves fact, case studies and interviews with her own personal experience, creating a text that suggests that perhaps we collectively waste our energies by chasing something we can only ever briefly achieve. I have found this book very useful so I will probably read it again.I think readers would benefit by there being an index.Ms Stark discussed people and ideas that I found very interesting ,thought provoking and helpful.eg Norman Doidge’s work on the brain ,Maslow and the hierarchy of needs ,Marie Kondo and “decluttering” and places like the Girton school with the RULER program .However without an index it is a bit of a hunt to find them again. Another thing:quite early in the book she mentioned I have found this book very useful so I will probably read it again.I think readers would benefit by there being an index.Ms Stark discussed people and ideas that I found very interesting ,thought provoking and helpful.eg Norman Doidge’s work on the brain ,Maslow and the hierarchy of needs ,Marie Kondo and “decluttering” and places like the Girton school with the RULER program .However without an index it is a bit of a hunt to find them again. Another thing:quite early in the book she mentioned two characters from modern culture which I guess are very negative and critical. Loved this book because as a mother of a teenage daughter it just seemed to echo challenges that young people are increasingly facing. Jill Stark talks with a refreshing honesty about feelings that i suspect are being bottled up around the western world in their millions. A great opportunity to observe somebody else's challenges in grappling with shame, angst, feelings of inadequacy and the challenges that accompany living in the first world in the 21st century whilst refle Great loved this book! Trying to read a little wider than I usually do, and this was a good way to do so. I enjoyed reading this, and it gave me lots of things to think about. Even if you don't suffer from anxiety, it has a lot to say about living life in this day and age, and promotes general self-care, mental wellbeing. A good mix of personal story and evidence based discussion. Picking up where her debut bestseller High Sobriety left off, journalist and author Jill Stark’s Happy Never After charts the period from her breakdown in October 2014 to her ensuing road to recovery. As someone with personal experience living with Anxiety, I was anticipating feeling a lot of feels reading this. I laughed as often as I cried, and I did a lot of both. Must read for anyone who has either lived with mental health issues or knows someone who has or does - So, basically everyone. Loved every illuminating page of this inspiring insight moving deeply helpful relevant memoir! Could not put it down and devoured it in 2 days! What a gift to us all! Everyone needs to read this book! Now more than ever! And that’s what I’ve been telling all my friends! But my daughter is reading it next so get your own copy! I listened to the audiobook and it was narrated by the author. Her voice is lovely. I think she may have been preaching to the converted here. The only thing I wasn’t crazy about was all the journalistic crap. I wanted to hear her voice, not ANOTHER rehashing of the Jam Study. This book was fantastic! It spoke to me on so many levels and I think there really is something for everyone in here, whether you suffer from anxiety or not. Definitely look forward to giving it a second read. Great read for anyone feeling overwhelmed or possibly suffering from anxiety. I got so much out of it! I cried and I laughed and I felt parts spoke to me and those around me. Very insightful and informative and very raw in parts. Loved this book! Jill Stark was born in Edinburgh, Scotland and now calls Melbourne, Australia home. She is the author of two books, and is an award-winning journalist with a career spanning two decades. 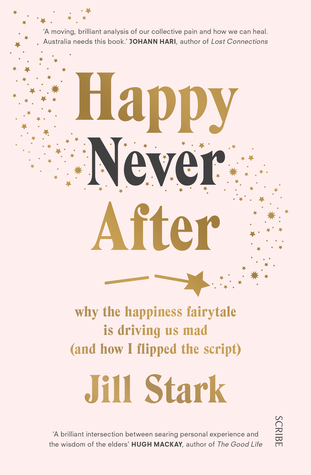 Happy Never After: Why The Happiness Fairytale Is Driving Us Mad (And How I Flipped The Script) is a forensic examination of our relentless pursuit of happiness in an age of anxiety. Her first book, High Sobriety: My Jill Stark was born in Edinburgh, Scotland and now calls Melbourne, Australia home. Her first book, High Sobriety: My Year without Booze is a best-selling memoir about her journey through a year off the grog, and a forensic exploration of Australia’s binge drinking culture. It was shortlisted for the Kibble Literary Awards and was a finalist in the Walkley Book of the Year.